Texas retailer CDNN Investments often acquires large inventories of overstocked firearms and then offers them at close-to-wholesale prices. When CDNN comes out with a new catalog you know there will be some amazing deals that won’t last long. The latest 2010-4 CDNN catalog was recently released. CLICK HERE to download CDNN 2010-4 Catalog. There are some great deals this month on Howa 1500-series hunting rifles. The lightweight “Lightning” model with 22″ barrel and Realtree camo stock is just $349.99, chambered in .243 Win, .308 Win, 25-06, .270 Win, or .30-06. Without the camo, a tan version in .243 Win is just $339.99. We were most intrigued by the Howa 1500 Custom Varmint models at $399.99. Fitted with 20″ or 24″ barrels, you have your choice of five popular chamberings: .204 Ruger, .223 Rem, .22-250, .243 Win, or .308 Win. 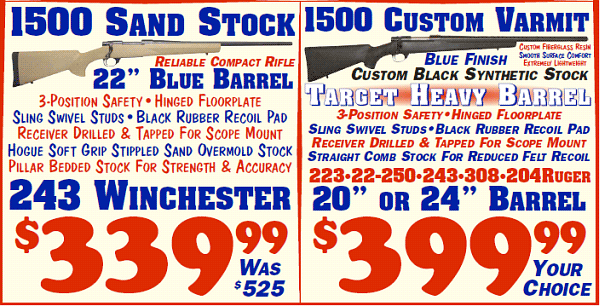 Listed below are some of the best gun deals we found in the new 2010-4 Fall Catalog. There are also some amazing deals on HK, Sig Sauer, and Springfield Armory handguns with prices “too low to print”. You’ll need to call CDNN at (800) 588-9500 for details. Winchester m70 Super Grade, .30-06 (24″ bbl) or 300 WM (26″ bbl), Fancy Walnut Stock, Engraved Receiver, $899.99. HK PSP 9mm handgun, ‘A’ grade select. 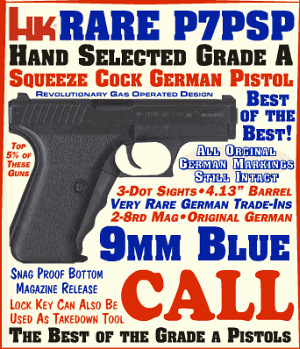 Every serious handgun aficionado should have a P7m8 or PSP squeeze-cocker in his collection. These are beautifully machined, slim, accurate handguns. Call for Price. Share the post "New CDNN Fall Catalog Available"